Today we’re getting our first hands-on look at the new Nest Thermostat E! Our Nest E is here! Let’s open it up!! 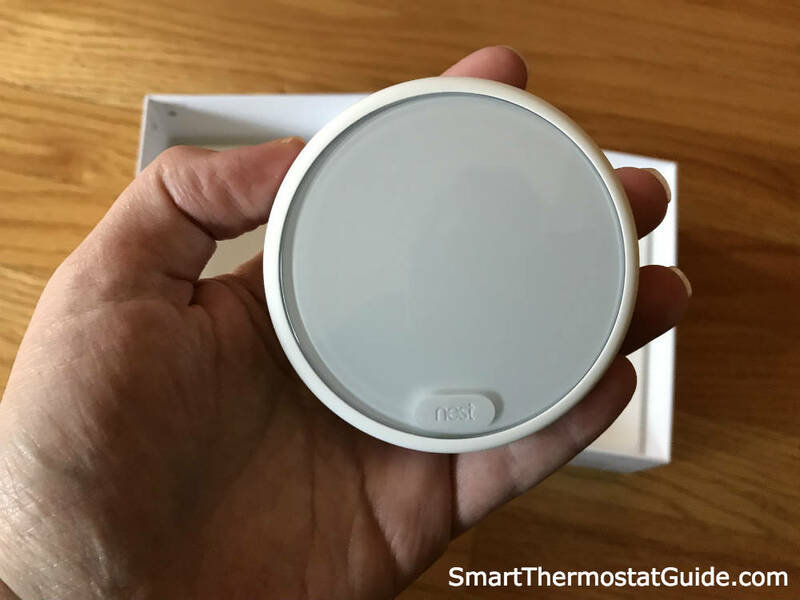 What’s new: The E’s $169 MRSP is well below the Nest’s usual price-point of $250, which makes it a) Nest’s first entry into the “below $200” category of smart thermostats and b) a direct competitor to one of our favorites, the ecobee 3 lite. The Nest E’s display is frosted and white, with a lower-resolution screen and an overall aesthetic meant for blending in, rather than standing out. What’s the same: Same app, same “learning” behavior, support for a wide variety of HVAC setups (not quite as many as the full-featured Nest, but a surprising amount of support nonetheless). 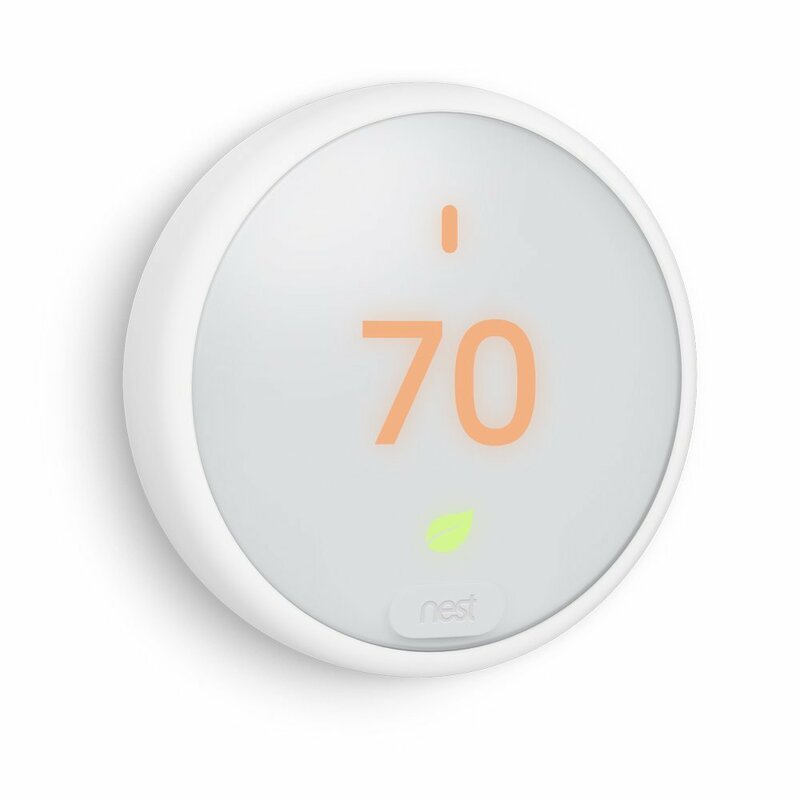 What’s gone: The E lacks support for having certain HVAC features at the same time and doesn’t have Farsight, Nest’s sophisticated motion-sensing technology that responds to your presence by changing its display to something (such as the time of day or current temp) that can be read from afar. Nest-family devices have always come in rather nice packaging, but this is the first one in at least a few generations to skip the whole “box sleeve over another box” design. I like this simpler box design, just one less step between me and what’s inside. Nest might have simplified the outer packaging, but the internal packaging is still the rugged cardboard “clamshell” we’ve come to expect from their products. The thermostat inside is quite snug between the two halves. You might not even notice the top half – it’s well-situated in the lid half of the box. 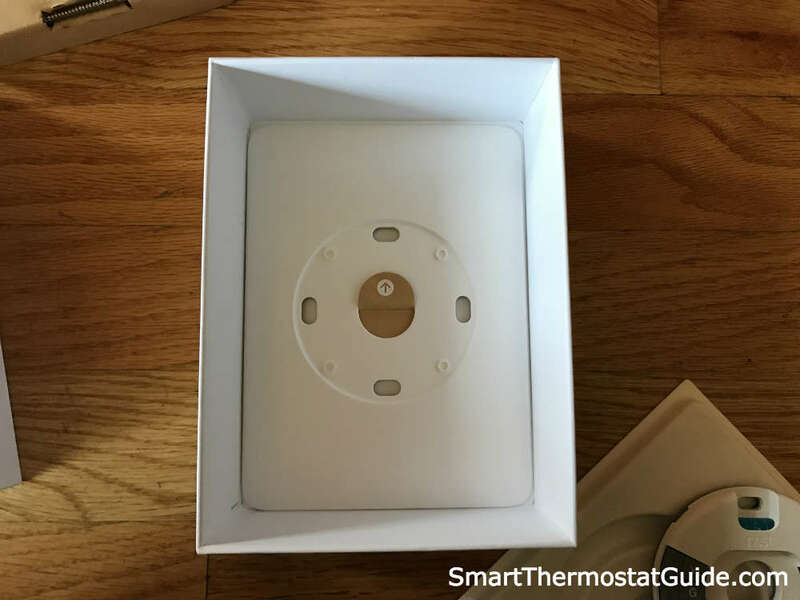 All you see when you open the box is the Nest Thermostat E! 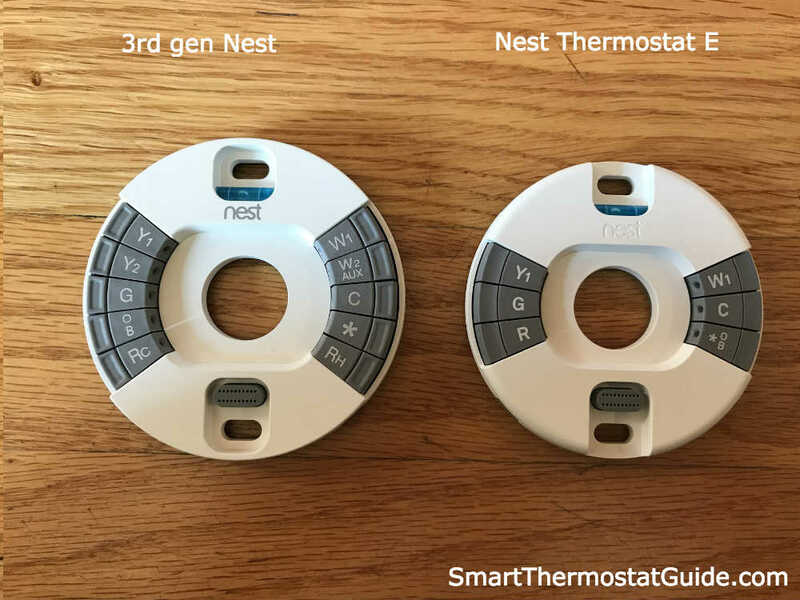 The Nest E is significantly lighter weight than previous Nests. Diameter-wise, though, it’s about the same as a full-featured Nest. For the sake of comparison, here is a 3rd gen Nest Learning Thermostat next to the Nest Thermostat E.
Here’s a closeup of the Nest logo etching. 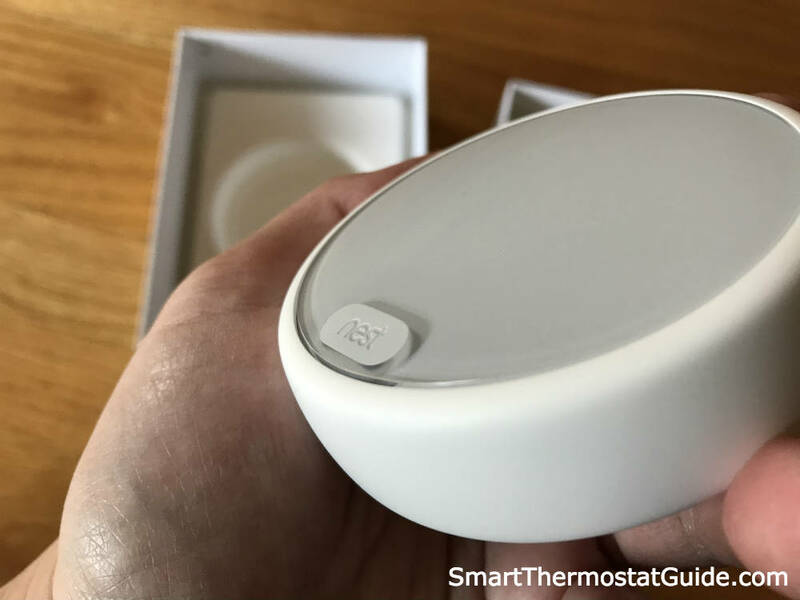 It doesn’t stick out from the face of the thermostat – it’s built into the glass, so the whole face is smooth and flat. The outer ring feels durable and well-attached to the hardware. It doesn’t feel plasticky at all, it’s a pleasing tactile experience. 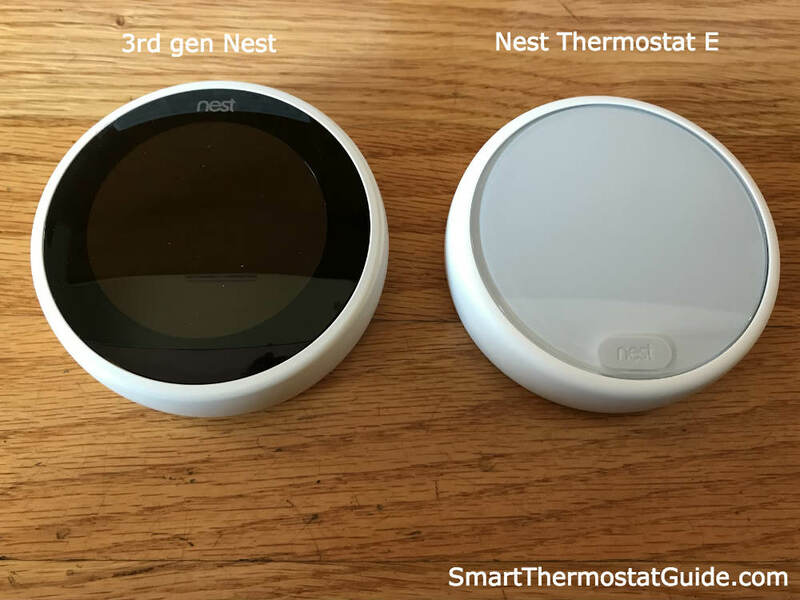 The finish is matte, so fingerprints won’t accumulate the way they did on earlier Nest models with their shiny outer rings. And here’s the back of the Nest E. The QR code is for scanning and adding the thermostat to your Nest account. For those of us who like having a paper-based installation guide open while they work on their devices, Nest was kind enough to include a printed booklet. Here’s the complete installation guide in PDF format. Under the installation guide is the base. The base is where you connect the HVAC wires to matching terminals. 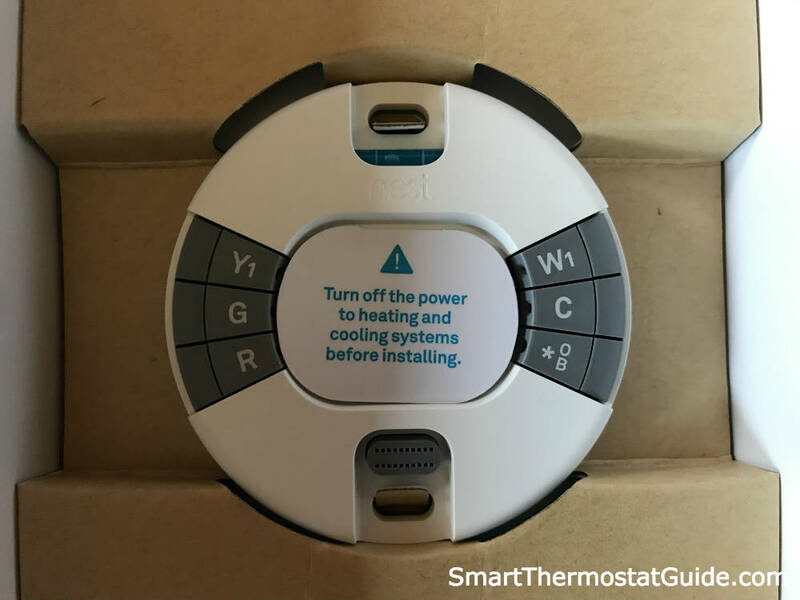 The thermostat pops onto the base when you’re done. 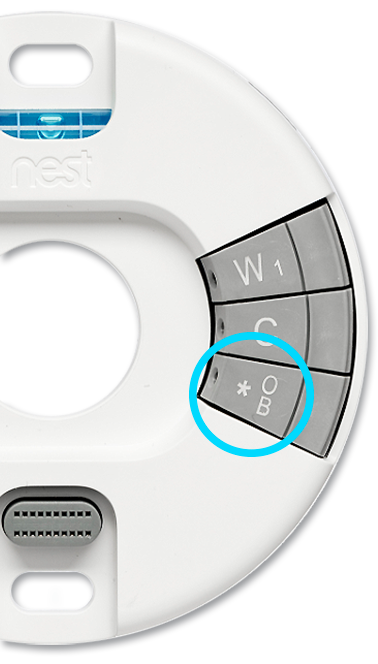 This new base is not compatible with any other Nest’s backplate, even though it’s about the same size. You may notice the Nest E’s base has fewer terminals than previous Nests or some competitor products. 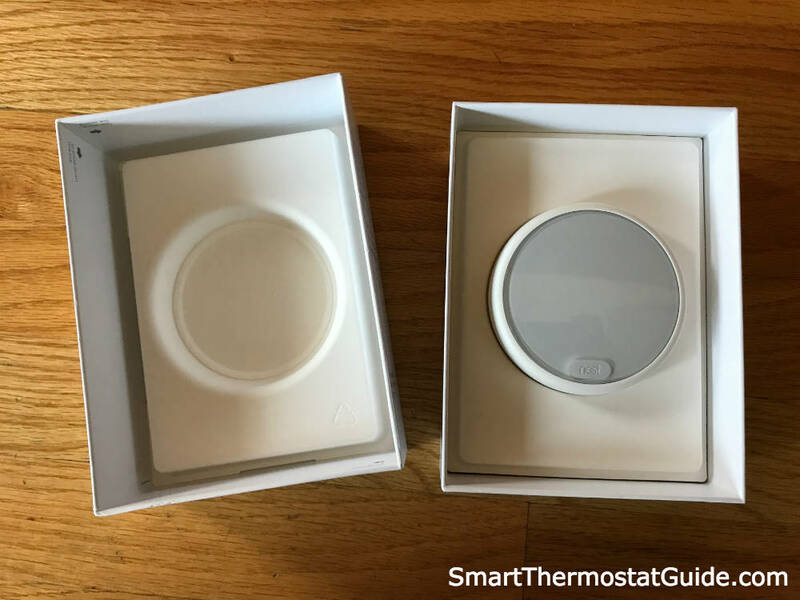 Below photo: a 3rd gen. Nest’s base vs. the Nest Thermostat E’s base. There are fewer wire terminals, so HVAC systems with multiple accessories (more on this in just a bit) might be left out of the Nest E party. Heating and Cooling: 1 stage of heating (W1) and cooling (Y1) and a second stage or either heating (W2) or cooling (Y2). 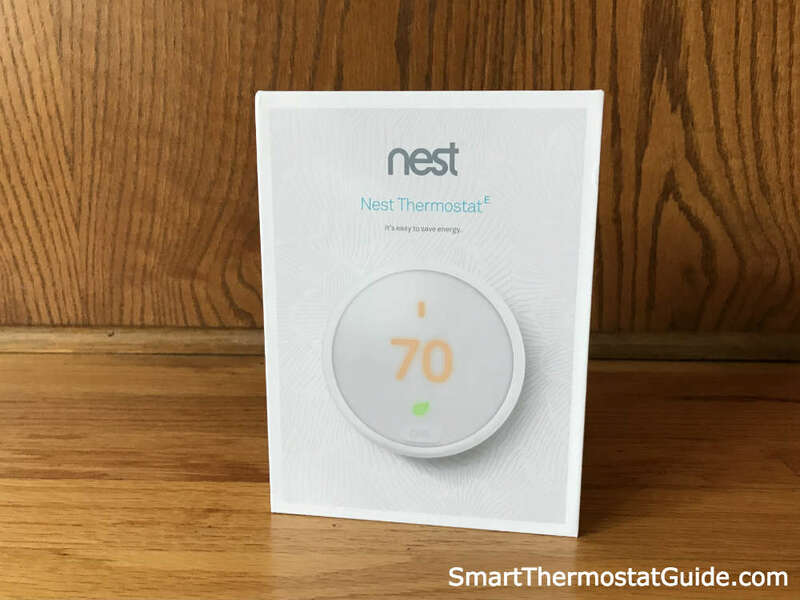 If you have a dual fuel system, Nest strongly recommends professional installation. 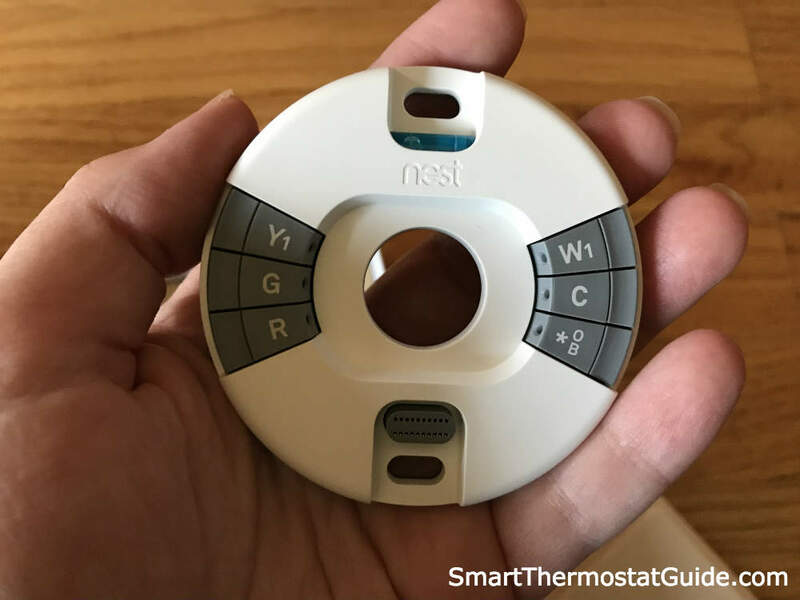 Because the Nest Thermostat E has the * (star) and O/B combined into one terminal, this limits the number of accessories you can attach. Basically, you can have stage 2 cooling OR stage 2 heating OR a heat pump OR a one wire humidifier. Furthermore, if this describes your HVAC setup, Nest recommends a professional installation. Noticeably missing from the Nest Thermostat E box is the complimentary screwdriver included with the more expensive Nest models. 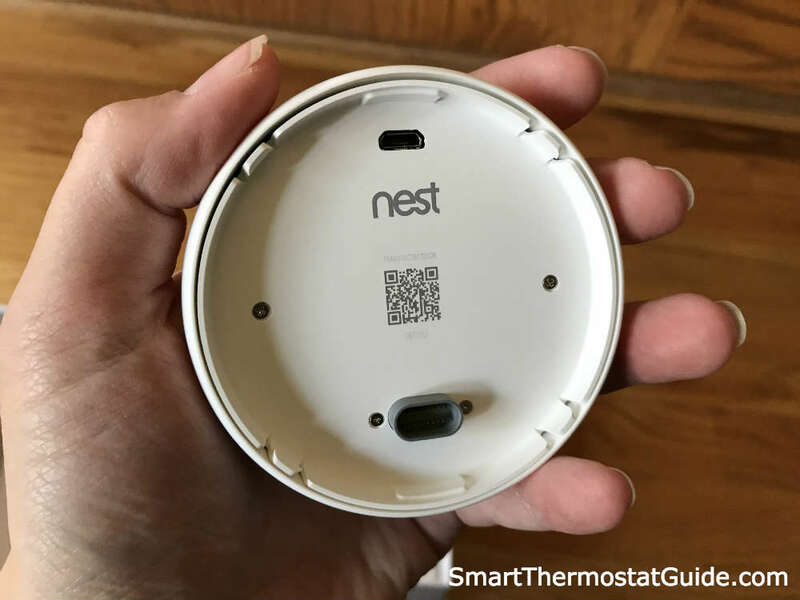 That’s fine – the screws for the Nest E aren’t some hard-to-find size. Last thing in the box: the optional backplate. 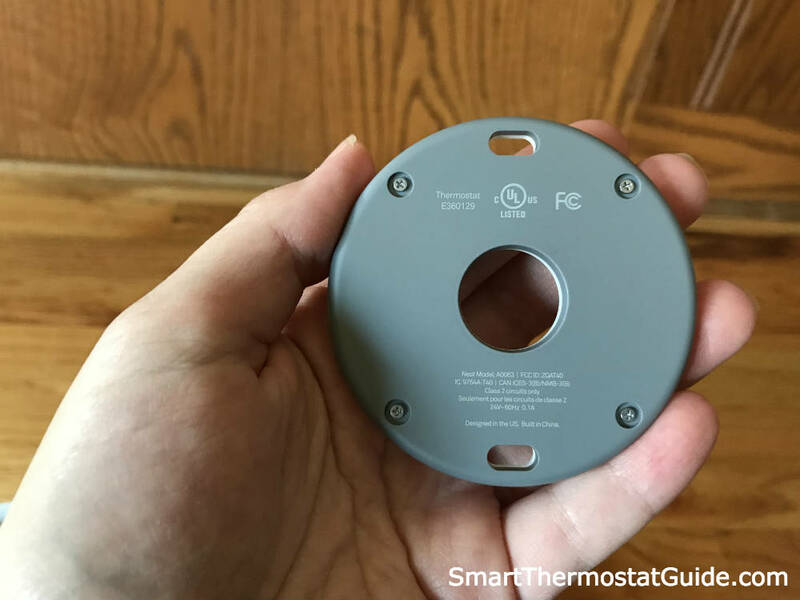 If your previous thermostat left an unpainted section of wall larger than the Nest E, this backplate can be used to cover it up. You can mount it vertically or horizontally. 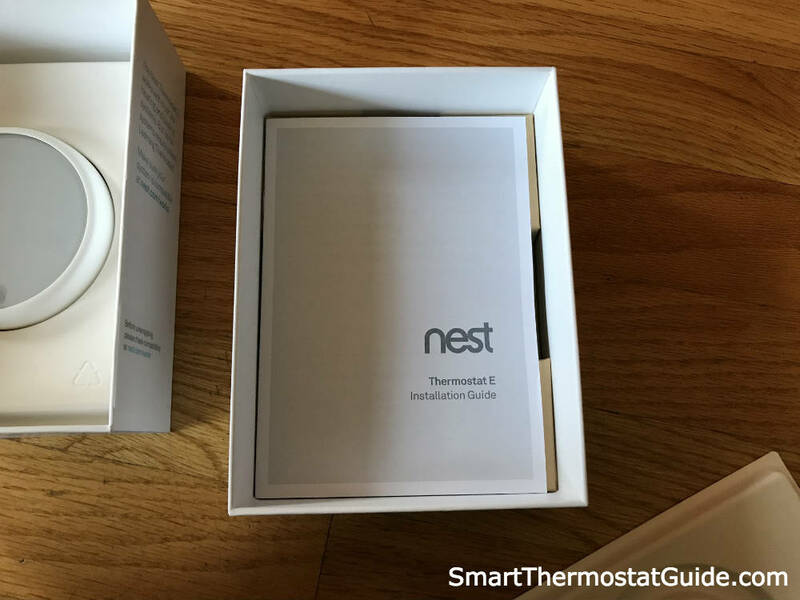 And that concludes our unboxing of the Nest Thermostat E! Below is what it looks like when it’s hooked up. The Nest Thermostat E’s display is white with a soft blurring/frosting effect. 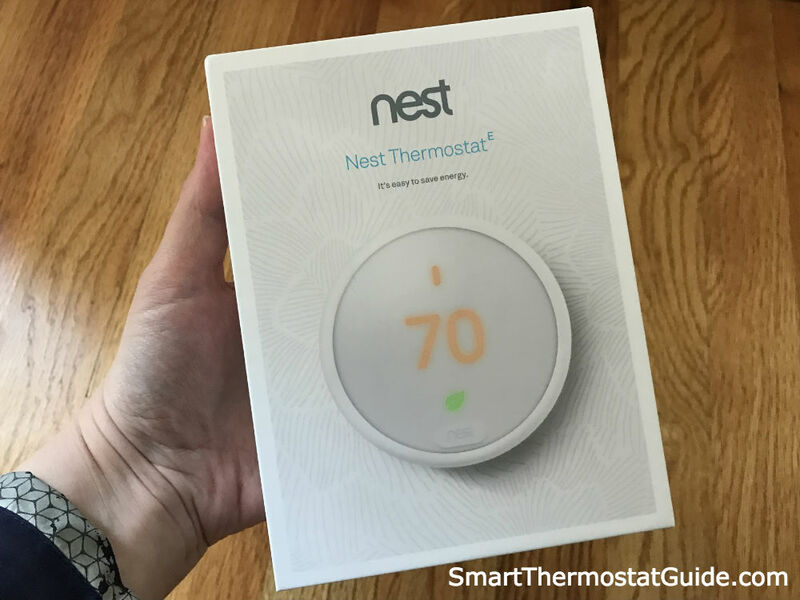 Note to shoppers: The Nest Thermostat E is very popular right now – and it’s no longer appearing on Amazon.com as of mid-November 2017. Many retailers seem to be having trouble keeping up with the demand. For now, nest.com seems to have it in stock. Happy shopping!